The few precious green spaces in our village North Bradley are being offered to developers to build yet more housing despite the Parish exceeding its housing obligations and while more housing is being built within sight of the village boundary. As per our North Bradley Neighbourhood Plan issued January 2019, our Parish Council are offering to allow developers to build mixed housing in the village fields on Park Farm (behind Orchard Way) and also on Woodmarsh (to the East of the progressive Hall) - please see copy of the North Bradley neighbourhood Plan Public Consultation January 2019, page 3, Policy 3. Also there are more acceptable alternatives to meet any future needs of housing obligations within our parish that simultaneously protect our green spaces and our wildlife from dying due to habitat loss. elmgrovetrowbridge.com a 250-280 home development on Drynham lane North Bradley Trowbridge which includes a Prinary school. Drynham lane is in the parish of North Bradley and if this development (elmgrovetrowbridge.com) goes ahead, it will exceed the required housing numbers proposed by both Wiltshire Housing and North Bradley Parish Council on the North Bradley Parish Plan published January 2019. Therefore, no further green fields ought to be lost. Should the development of elmgrovetrowbridge.com not go ahead, we propose that our Village Parish Council offer any of the Long-Term Vacant buildings within the Village's White Horse Business Park, which are empty, currently for sale and have been for many years. Leaving them empty while destroying more wildlife is deeply shaming knowing the vast wildlife habitat that was lost to create the business park in the first place. One of these vacant spaces which is appropriate as a renovation/ housing project is the extensive, 3 Pavillion building of Barclays Global securities services (Bgss) which was later owned by Virgin Mobile (Vm) and has been sat vacant for nearly 2 decades excluding Virgin's short occupation. This building is vast and can be remodelled into 98 X 1&2 bedroom apartments with parking allocation for 600 cars. It is surrounded on all sides by grassy hills, framed ponds, ample trees and foliage offering a peaceful setting that overlooks open pasture to the south and west. The site could easily be turned into sleek modern apartments / secure retirement apartments with ample space to include warden accommodation if it were used for retirement purposes or the entire space including the parking could be remodelled to provide typical mixed family housing. It is senseless to permanently destroy our fields which are used daily by many nature lovers within the village and visitors from surrounding towns as natural unspoiled spaces of leisure and reprieve. We are equally concerned that under current laws, our myriad species of endangered and protected wildlife such as Bats, Great crested Newts, Barn Owls, Tree Sparrows as well as species such as Kestrels, Buzzards, Heron, Deer, Badger, Fox to name a few, will not have alternative habitat and feeding lands and although they won't be directly killed during build works, they will die off because there will be nowhere for them to live, hunt and reproduce. We feel this is unacceptable given that there are alternative options that have sat vacant for so long. After discussing the ecological issue with the Ecology department of the Local Council prior to the granting of permission & start of development of the unwanted 2nd Petrol Station, the Council Ecology Deoartment staff member agreed that although the developer's submitted plans, outline their actions to mitigate directly killing protected species, the wildlife would obviously die indirectly due to the permanent removal of their habitat and food sources which were all going to be destroyed by the build with no wildlife areas of equal size, age and biodiversity being provided in compensation. The Ecology Department also stated they could not object to these plans after receiving the ecology submission from the developers because the current laws do not provide for measures beyond catch and release for the newts and leaving/planting some foliage for Bats and ensuring use of Low lighting near the Bats which leaves little assurance for the remaining wildlife being put in jeopardy by these proposed developments. We are also concerned that the value of our homes will reduce if we become housing estates, something we are unwilling to accept given the higher premium paid to purchase homes in rural villages. We have serious concerns regarding both traffic along Ash Drive and Orchard Way for Park Farm proposal and Woodmarsh and Westbury Road for Woodmarsh proposal, these narrow village bridle paths and roads cannot safely provide emergency vehicle access and services into these proposed housing estates, the larger Westbury road and Woodmarsh are inundated with speeding traffic as it is and Orchard Way residents struggle to safely navigate the narrow road. Extending these roads and adding housing would pose a real danger to the children, pedestrians, horses and wildlife that use them daily, as well as making it very difficult for emergency services access. Losing a Child to traffic, is regretfully something this village has experienced already. When Orchard way was extended slightly in the late 1990's, the additional 9 houses caused great difficulty to the existing sewage works; buyers were asked to purchase additional waste surveys and sadly some have had raw sewage surfacing up and over their cloakroom toilets, due to the existing sewage work's inability to cope with additional housing. Some have had drains dug up no less than 15 times in their gardens during the first 10 years of living here and in some cases residents have had their entire garden dug up to replace waste pipes and they continue to pay for specialist insurance to cover the ongoing maintenance needed in this road to assist the sewage works of the area. Adding 60-180+ more cars to each of our little village roads and potentially 60-180+ more toilets to an already overwhelmed waste system is 'shortsighted' at best. We see no reason why more fields should be lost to development when there are houses being built on Drynham Lane and very close to the village on the old Council offices at Bradley road which all go towards fulfilling the housing requirements of central gov and when we have more than ample vacant space to accommodate housing /apartments on our own derelict sites on the business park. 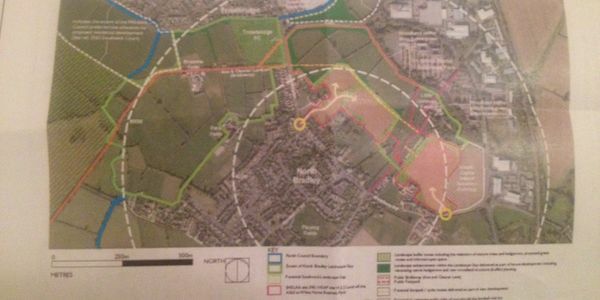 *acknowledge that the proposals of Elmgrovetrowbridge.com 's 250-280 new homes and school on Drynham lane will more than adequately fulfill both the WHAP 190 homes & NBPC's 60 home proposals of new mixed houses and therefore there is no need to destroy our green fields. *We propose that any future housing needs be met first by derelict sites instead of green fields in accordance with Davos 2019. (Derelict sites on White Horse Business park - aesthetically pleasing, secluded by many native trees, small ponds and grassy hills, produces low-noise, already set up with safe entry & exit roads & has public transport and adequate utilities in place). Thank you from Residents and friends of North Bradley. We only need just over 600 more signatures, please share on your social media profiles if you have them/email to friends & family, anyone 18+ can sign, so your spouse/partner, children etc all count. Thank you. According to the Planning consultant in order to protect boundaries, plots must be offered for housing. we have ample empty commercial buildings (brownfield) that can and should be offered before we acquiesce to the neighbourhood plan and lose our fields. Jan 17th 2019, an additional housing plan was exhibited to the public (not us?) which is proposed for Drynham Lane NB, named 'Elmgrovetrowbrudge.com'. A 250-280 mixed housing and a ks1&2 primary school. This exceeds both WHAP & NBPC housing requirements and should mean no additional housing will be expected in the village. Please look and attend consultations 8th/9th Feb to speak up for our fields & share with neighbours.